UPPER: on top of the reef at Faga'alu, west Pago Pago Harbor, American Samoa. 4 September 2000. Photo: Don Barclay. LOWER: Msasani Bay, Dar es Salaam, Tanzania, September 1974. Photo: Bill Rudman. 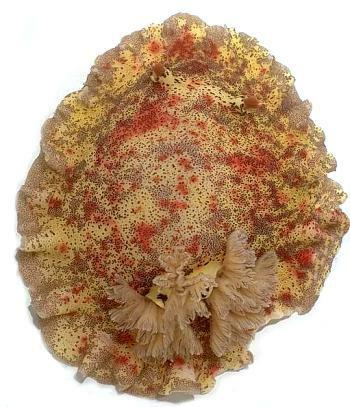 Very similar to Platydoris scabra, with fine brown specks, but differs in having large red patches (as in Platydoris cruenta), and bright red rhinophore clubs. The underside of the mantle is white with fine brown specks on the inner half and larger red patches all over. 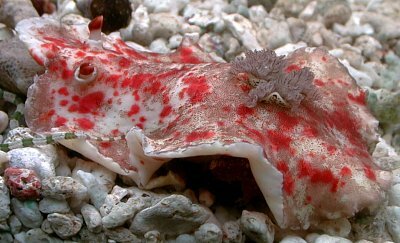 It has characteristic patches of brown specks and large red. This group of similarly coloured species is discussed under P. scabra. The original description of Doris picta Kelaart, from Ceylon, describes both dorsal and ventral surfaces to be splashed with large and small brick red spots. This is not obvious from the illustration later published (Eliot, 1906). However Eliot's description of the type specimen and its radula clearly indicate a species of Platydoris, and almost certainly the species later described from nearby India as D. formosa. As the name D. picta is preoccupied by two earlier usages, Doris formosa is the earliest available name. The specimens reported here from Zanzibar, and this photograph of a specimen from New Caledonia, and records from Hawaii (Kay & Young, 1969), suggest a wide Indo-West Pacific distribution. Grows to about 15cm long. • Alder, J. & Hancock, A. (1864). Notice of a collection of nudibranchiate mollusca made in India by Walter Elliot Esq., with descriptions of several new genera and species. Transactions of the Zoological Society of London, 5: 113-147.